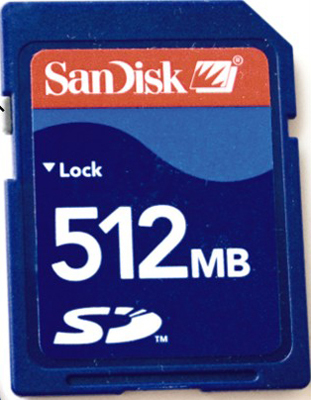 A digital camera’s memory card is a key element of taking pictures. Read on for tips about your Canon EOS Digital Rebel XSi/450D’s memory card, including how to insert and remove it, how to format it, or even how to protect the digital photographs you’ve stored on your SD card. 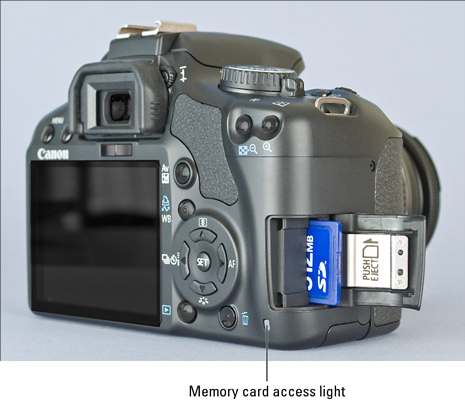 The Canon EOS Digital Rebel XSi/450D uses a specific type of memory card called an SD card (for Secure Digital), shown here. 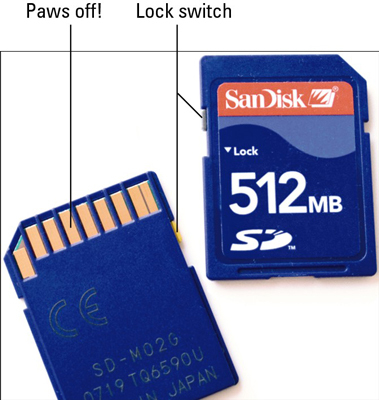 You can also use the new, high-capacity Secure Digital cards, which are labeled SDHC, as well. First, be sure that the camera is turned off. Then put the card in the card slot with the label facing the back of the camera, shown below. Push the card into the slot until it clicks into place. Formatting your card ensures that the card is properly prepared to record your pictures. When you first insert a new card into your camera, choose the Format command from the Setup Menu 1. You can now opt to perform a normal card formatting process or a low-level formatting. Low-level formatting gives your memory card a deeper level of cleansing than ordinary formatting and thus takes longer to perform. Normally, a regular formatting will do. First, check the status of the memory card access light, labeled in the figure above. After making sure that the light is off, indicating that the camera has finished recording your most recent photo, turn the camera off. Open the memory card door. Depress the memory card slightly until you hear a little click and then let go. The card should pop halfway out of the slot, enabling you to grab it by the tail and remove it.